Here is an article I wrote titled ’11 Things Nobody Tells You When You Go Vegan’ that some might find of interest. I went vegan about 2 years ago as of the time of this writing. I don’t remember the exact day as I was first eliminating gluten due to digestive issues which shortly after ended up with me giving up meat and dairy. After doing some research into gluten and then how food is prepared in general I eventually came across how the meat and dairy industries conducted business, particularly how animals are raised and treated. Of course, what I found was beyond horrifying. Giving up meat and dairy was easy at that point because after eliminating gluten (one of the hardest things I’ve ever done) a few more products were no big deal. That is how I started my journey to begin eliminating as many animal products as possible. It wasn’t easy as so many things incorporate animal parts or utilize animal testing to develop their products. Veganism is the future. A world free from animal violence is one that everyone can agree with. Spirituality is a major component here. We hear all the time that we need to raise our vibrations and when looking into this further, our diets will inevitably come up for examination. Meat and dairy as we know of it today is derived through violence. Animals fear for their lives when they are forced to exist in concentration camp like conditions. These fear/anxiety/stress hormones are passed on into their cells and muscles which are ultimately harvested for food, which is then eaten by people, who absorb these vibrations and hormones into their bodies. You are what you eat. To me this is very simple. I have compassion for all living things, so does everyone else, but ‘powerful people‘ have employed advanced mind-control techniques (multi-generational advertisement campaigns) to brainwash people into thinking they require things they don’t really need and to disregard their innate sense of empathy. One thing these ‘powerful people‘ fear is that we realize what is going on behind closed doors (people are putting their lives on the line to tell us this) and that we abandon their mind-control programming and choose to think of the animals instead of our taste buds. This is why recording is not allowed in the slaughter houses (99% of meat comes from these places). You go in, you see a torture chamber with victims being torn apart, raped, beaten and living in their own feces and blood, you don’t want to eat it anymore. They don’t want that. For someone with their own mind and their own sense of compassion and empathy intact, this should be very black and white. The ONLY other reason for an opinion otherwise, is mind-control. 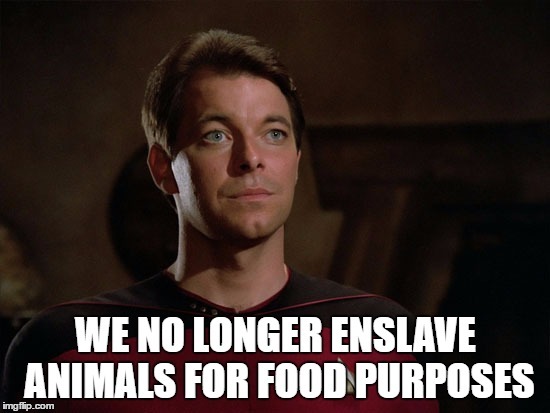 Remember, the crew of Star Trek is all vegan. They only eat replicated food. If you see my article, I show you all of the amazing meat and dairy alternatives there are to choose from. I had no idea there were so many until I looked for them. Many of them resembling the taste and texture of the real thing. Imagine shredded ‘cheese’ that melts! And of course, it’s not about taste, it’s about animal welfare, and raising your vibration as high as possible, which is critical at this time.